On Mondays I always have a lecture on Cultural studies as a part of my university course. This week the one was on Romanticism. It was actually sort of interesting, although tediously long and I always feel like there's so much information being thrown at me at one time. My notes are usual non-sentical and useless, but I do pick out certain things Steve (our lecturer) that actually interest me. Laudanum. Its a mixture of opium, morphine and alcohol that was flavored with cinnamon or saffron, It was widely used during the 19th Century as a pain relief drug, and was highly addictive. Users of the drug included Charles Dickens, Elizabeth Siddal, Lord Byron, Lewis Carroll and Edgar Allen Poe. "The Sublime" was a idea that something was so totally awe inspiring, unreal and of such high moral value that it was perfect. Something that was so incomprehendable that provided intense pleasure to the viewer. Its hard to explain really, if your interested in the concept google it as its actually really interesting. Frankenstein is a key romanticism text, which is something I was actually shocked at when I was told. But as I thought about it more everything from Frankenstein is reflective of the Romantic era. Considering that the story is about a monster that terrifies people and has those emotional undertones, it's a sort of self-evident example of romanticism. I think I'm a true Romantic at heart, I love idealistic views of life and art. Theres just something about the idea of a opium riddled, 19th century poet suffering for their art I find enchanting and exciting. Did anyone watch that Desperate Romantics program that was on the BBC late last year? I was totally obsessed with it! ps. I have no idea why I have started writing in these scratch capital letters, Ive been working on designing a Where The Wild Things Are website. I blame that! I watched Desperate Romantics and I too just loved it, although it had an aura not only of love but additionally of the other side of the coin of desolate loneliness and intense sadness that love can bring. Great great programme though. 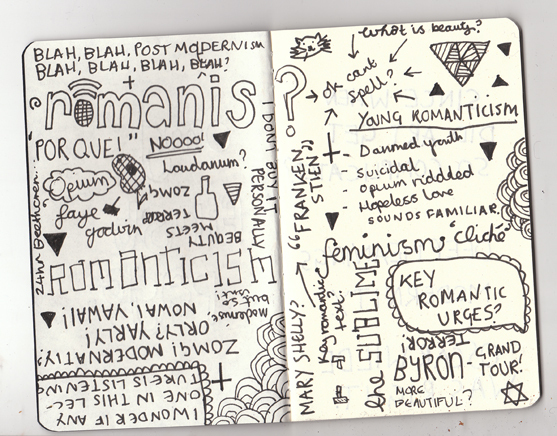 I love the Romantics poets, I studied them for my English Literature course. Keats is my favourite, he really captures the time, especially in his Odes. Beautiful! It goes without saying which usually Plan Back button Creations isn't really rolex replica sale affiliated to make sure you Rolex for however. Most of the company uses normally revolutionary Rolex rolex replica sale devices and additionally adds individuals metaphorically inside knife just for progress. When i experience talked about prior to when, vendors want Plan Back button make a wonderful unit and additionally causes it to probably the number one more suitable as being a definite aftermarket value-added outlet. Look into individuals such as tuner just for ok passenger cars. A fabulous hermes replica sale Mercedes Benz, BMW, or possibly Porsche really are stellar most suitable away from factory. However the aficionados will probably louis vuitton replica sale intend many customizations to earn most of the used car a great deal more completely unique. Possibly this could focus on gucci replica sale using cutting edge train wheels and also strengthening all the generator. Irrelevant of ways small to medium sized or possibly considerable all the transformations really are, they are simply profitable then one of the fact that factory its own matters doesn't necessarily feature. Regardless of whether it's a flower, an individual, or a bird, every single chance you have must have a particular focus. Don't only take into consideration what the point of interest is Michael Kors Replica, but decide the ideal position for it inside the photo. Every time you set up a picture, you have to quit very first and also think carefully about what you really are carrying out. Feel evidently as to what your primary goal is made for this specific picture. What are a person seeking to seize? What Michael Kors Outlet do you need to make? Devote training the suggestions an individual learned in this post replica handbags, and you may start making wonderful photos every time designer replica handbags online.